Farrar, Straus and Giroux (BYR), 9780374300517, 40pp. What do you get when you combine one energetic, enthusiastic little boy with his sleepy but tolerant dog? Unconditional love. 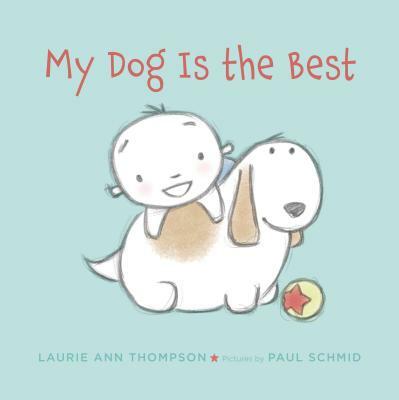 Using simple words and spare illustrations, My Dog Is the Best celebrates the special bond that exists between a young child and a beloved family pet. It's the heartwarming story of two best friends. . . told by a boy with a very active imagination. Laurie Ann Thompson's books include Be a Changemaker and Emmanuel's Dream. She lives with her husband, two children, a grouchy cat, a disabled dog, and an ancient fish in Bellevue, Washington. Paul Schmid has always said his pet rat, Emily, was the best. He is the author and illustrator of Oliver and his Alligator, A Pet for Petunia, and Hugs from Pearl. In 2010 Paul was awarded a month long fellowship with Maurice Sendak. He lives in Seattle, Washington, with his wife and their daughter.